Are the space agency's goals too modest? The explosion that destroyed the space shuttle Columbia in February, killing all seven crewmembers, has temporarily halted shuttle flights. President Bush says manned space flight will go on. And in coming years NASA not only plans to continue flying the remaining shuttles but also to build a new orbital space plane to ferry astronauts to the International Space Station. 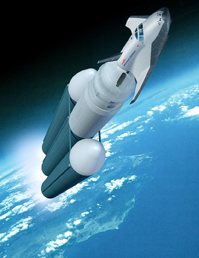 The wisdom of building a vehicle that only carries four to six crewmembers and no cargo, however, has drawn criticism. Moreover, many critics say NASA focuses on unexciting and unnecessary orbital missions when it should be planning cutting-edge expeditions to Mars and beyond. Meanwhile, the Columbia tragedy has renewed criticism that the space agency is not focused enough on safety and that its decision-making processes are flawed.